Stratford Homes Timber Creek | Excelsior Homes West, Inc. If you are looking for a loft style home with a second floor master suite, the Stratford Homes Timber Creek may be the home for you! The Stratford Homes Timber Creek has just over 2500 square feet of space that includes three bedrooms and two bathrooms. This floor plan has a large living room that is open to the loft space above. Upstairs you will find the extra loft space and secluded master suite which includes a full wall of closet space and the master bathroom. All of the other bedrooms and bathrooms are located on the main level of this Stratford Home! This home also has some great features when it comes to the kitchen space–extra seating with the raised snack bar, walk-in pantry, plenty of countertop space, and much more! Visit Excelsior Homes West, Inc. in Hutchinson, MN. We have over 10 model homes to tour and all the answers you need to start the modular home building process! 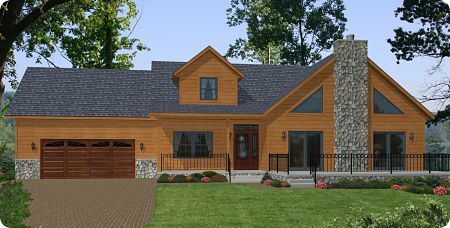 The Stratford Homes Timber Creek can be customized with options and upgrades. The Stratford Homes Timber Creek is a spacious, two-story home. With Stratford Homes, you can make this floor plan your dream home by adding your personal touches. Choose your countertops, tile backsplash, flooring, cabinetry, exterior finishes, etc. There are a number of materials and finishes available for this modular home. This floor plan also has the option of adding a fireplace in the living room–create a more cozy atmosphere! Call us today for more information and pricing details!